Star Trek: Asterisk "The Enemy"
Geordi gets stuck on a planet with nothing but a Romulan to help him. Riker, Worf and Geordi beam down to the surface of a really stormy planet to check out some Romulan activity on it since it's beyond the Neutral Zone. The storms screw with electrical equipment, so they need a device to lock onto their position to beam up, and they couldn't bring Data because he would just break down. So they take a look around and see a crashed Romulan shuttle that was purposely exploded after the crash. A while after, Worf finds a Romulan on the verge of death. Then Geordi falls into a hole, but they have to get the Romulan back to the ship, so Worf and Riker beam back up with the Romulan hoping they can get Geordi while on the ship. Nothing could possibly go wrong. After a while, Geordi melts some natural metal into spikes to help him climb out of the hole all Macgyver-like while on the ship, two things are happening: 1) Wesley comes up with the idea to send down a probe that'll shoot out a neutrino beacon that Geordi will be able to see with his VISOR, and 2) The Romulan on board is going to die unless he receives a blood transfusion from Worf. 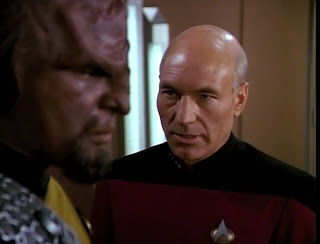 It's easy enough for Wesley to whip up that beacon and send it down to the planet and it's just a simple matter of Geordi getting to it so the Enterprise can lock the transporter on him, but Worf is uncomfortable with the idea of giving up his blood - and that of his father and mother - to a member of the race that was responsible for killing his parents. 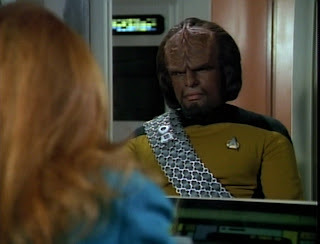 But, then, Worf always looks uncomfortable. So, the Romulan commander is not pleased with the fact that one of his men is dying on the Enterprise and he's threatening to cross the Neutral Zone himself to take control of the situation. Meanwhile, Geordi and his buddy Romulan are struggling to figure out what to do. Geordi says if he could connect his VISOR to the tricorder he might be able to figure out where the neutrino beacon is, but he can't see in order to make this happen. So his Romulan buddy does it for him and they make their way to the beacon. Meanwhile, everyone's pressuring Worf to give his blood to the Romulan, but he won't do it. He will not dishonor his family by giving his blood to save his enemy. Doesn't really matter, though, 'cause the guy dies soon anyway. "I do not wish to order you to do this. I double-dog dare you." Eventually Geordi and his Romulan buddy make it to the beacon and begin modifying it so that the Enterprise knows they're there. Meanwhile, the Romulan commander gets wind of his man dying on the Enterprise and is pissed. 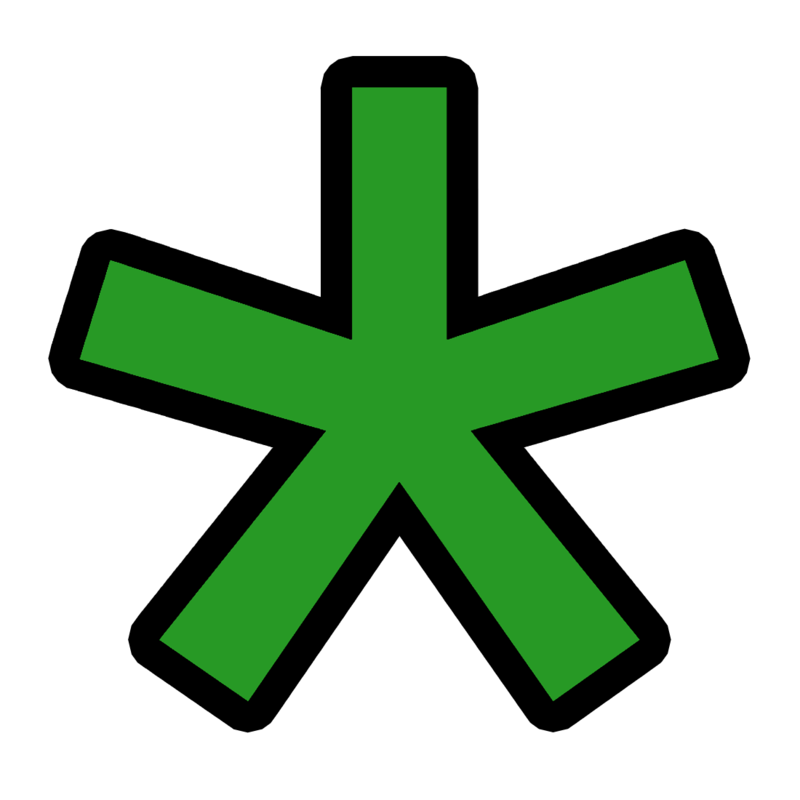 At the risk of starting an interstellar war, he crosses the Neutral Zone and threatens the Enterprise. That's when they pick up on Geordi's signal and realize there is someone else with him. 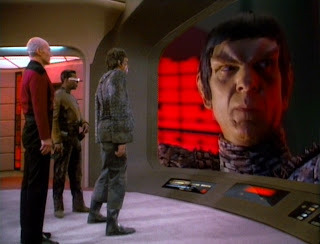 Without knowing for sure that the second man is Romulan, Picard tells the Romulan commander that they found another one of his men, which would expose his lie. The Romulan Commander claims to have been misinformed about the size of the shuttle, but still demands his man back. A window in the violent storms on the planet appears and gives Picard the ability to beam Geordi and his Romulan buddy directly to the bridge. Once there, the Romulan buddy assures his Romulan commander that he didn't give any information, but that Geordi had, in fact, saved his life. Geordi confirms the story and an interstellar war is averted. And everyone lived happily ever after and learned a valuable lesson about friendship. Romulans are friends, not food. One of the enduring messages of Star Trek is that we can learn to get along with anyone and we don't have to descend into war. 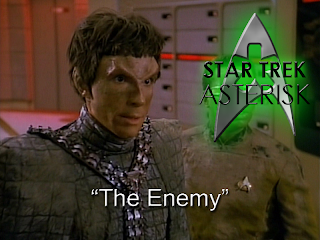 Even with an enemy as enigmatic and belligerent as the Romulans, we can still work together for a common goal. The use of Geordi's engineering skills was perfect in this episode even if he had to use someone else as his eyes. Perhaps even because of that reason. And the juxtaposition of this message with Worf's refusal to give in to his enemy's medical needs tells exactly how non-human Worf actually is. A+ on this episode.